Catholic school leaders graduate from Emmaus Leadership Series. Published 5/18/2018. Local. BRAINTREE -- The Emmaus Series for Catholic School Leaders, a program of the Roche Center for Catholic Education at Boston College, recently celebrated the commencement of its 2016 Cohort of Catholic school principals and heads of school, marking the close of a 20-month impactful leadership development program. Nineteen school leaders took part in the commencement, which featured keynote speakers Eileen McLaughlin, Head of School at Mount Alvernia High School in Newton and Father Ronald O'Dwyer, S.J., clinical faculty member in the Institute for Catholic Education at St. Louis University and director of the Billiken Teacher Corps (BTC). 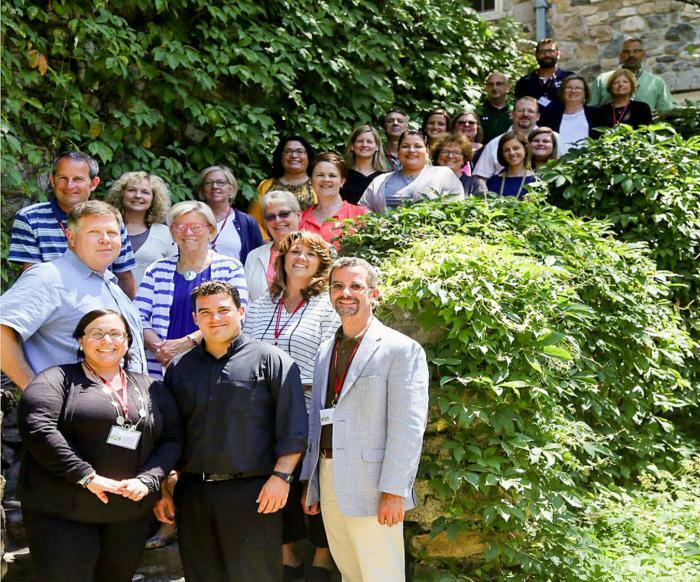 The commencement was preceded by a day-long workshop on systems-thinking for more than 40 Catholic school principals currently in the Emmaus Series and their leadership teams. The Emmaus Series program is designed to form transformative leaders in Catholic education by offering quality training to deepen their knowledge of spiritual leadership, instructional leadership, and business management. It consists of workshops, webinars, and retreats focusing on key issues such as effective financial planning, marketing and enrollment, and Catholic school mission, among others. Leaders who complete the Emmaus Series are prepared to make their schools' missions and visions a tangible, sustainable reality. The Catholic school leaders from the Archdiocese of Boston graduating from the program this year were: Mark Bedrosian of St. Raphael Parish School, Medford; Cara Blanchette of St. Charles School, Woburn; Helenann Civian of Cathedral High School, Boston; Eileen McLaughlin of Mount Alvernia High School, Newton; and Lisa Warshafsky of St. John Paul II Catholic Academy, Lower Mills Campus, Dorchester. "The Emmaus Leadership Program is a wonderful experience!" said Mark Bedrosian, principal at St. Raphael Parish School in Medford. "Its emphasis on the 'Standards and Benchmarks for Effective Catholic Schools' has involved our entire school community. Our parish school advisory board, director of admissions and development, business manager, teacher leadership team, and dean of academics all attended trainings and we continue to implement what we learned. 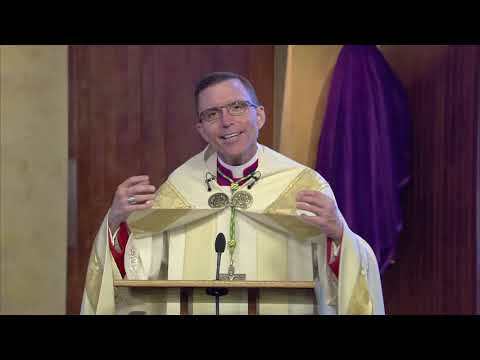 The program was meaningful, challenging school communities to set attainable goals that align with archdiocesan goals, as well as the goals of our parish. The Roche Center staff were always well prepared, organized, and accommodating. St. Raphael Parish School will certainly continue its relationship with Emmaus. Our entire school community continues to enjoy the benefits of participating in the Emmaus Leadership Program," he said. The 2016 Cohort represents 10 dioceses and archdioceses in nine states. 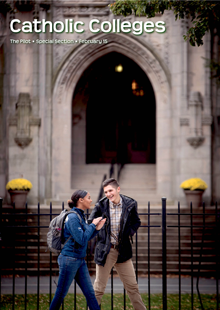 Over the course of the 20 months of the Emmaus Series, the group has benefited from the professional insights of experts from Boston College's School of Theology and Ministry, Lynch School of Education, and Carroll School of Management. Together they have considered best practices for entrepreneurial leadership within a robust framework of Catholicism. "Our goal with the Emmaus Series is to bring together outstanding experts from a variety of fields to help Catholic school leaders assess and re-envision their schools," said Kristin Melley, director of professional development for the Roche Center. "We focus on developing the individual leaders as well as their teams. We do this while fostering companionship among the school leaders as they support each other for continuous learning and information-sharing." The Emmaus Series has graduated more than 60 Catholic school leaders since it was first launched in 2012. Based on the continued research and leadership of Boston College's Roche Center for Catholic Education, the program will welcome its 2018 Cohort of Catholic school leaders in July.